Our Lady appeared to her for the first time on June 25, 1981. She still has apparitions every day, and is the visionary to whom Our Lady gives the public message to the world on the 25th of each month. Our Lady has confided nine secrets to her so far. Marija is presently living in Italy, is married, and has four children. She visits Medjugorje a number of times each year. 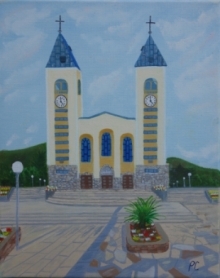 Marija: "Everything has changed in Medjugorje. People started to pray and listen to Our Lady's messages. Before, I didn't pray enough. Now I want to pray more and more. I'm sure God gives much to everyone who's open to prayer. I tell people they should pray more, and Our Lady will give them peace in all that burdens them. It's not I, it's Our Lady who urges us to nurture prayer, to propagate peace, and to fast. She says that everyone who comes to Medjugorje, must be converted. They must encourage other people too, to pray and fast. God wishes us to pray and fast. God wishes to develop the parish and make it grow more and more in faith. If people accept the messages, God will lead them."